Psst. Come here. Closer. No, closer than that. We have a special announcement just for you, iPad users. A little present just for you being you. Starting today, July 9, Magic 2015—Duels of the Planeswalkers is available on iPad—one week before other platforms begin releasing July 16. That means that iPad users get an exclusive first-play experience with Duels, allowing them to, ahem, Hunt Bigger Game. 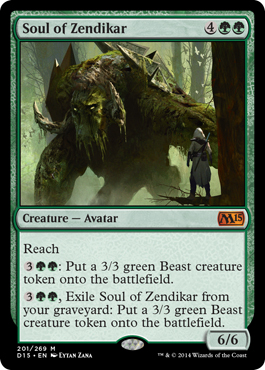 Players play as a Planeswalker attempting to stop Garruk Wildspeaker from hunting new quarry—you. Don't have an iPad? Don't worry. Magic 2015—Duels of the Planeswalkers will later launch on PC via Steam®, Xbox 360, Xbox One, Amazon Kindle, and Android on Google Play beginning July 16. And remember, purchasing Magic 2015—Duels of the Planeswalkers gives you access to a cool, six-card promotional booster featuring one of these two cards. Purchasing Magic 2015—Duels of the Planeswalkers on iPad, PC via Steam®, Android tablet via the Amazon App Store, and Google Play will give you access to Soul of Zendikar. 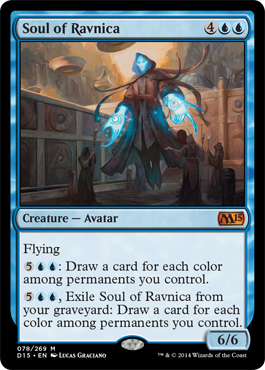 Xbox 360 and Xbox One entitle you access to Soul of Ravnica. So what are you waiting for? Jump on your iPad and start hunting bigger game—today!